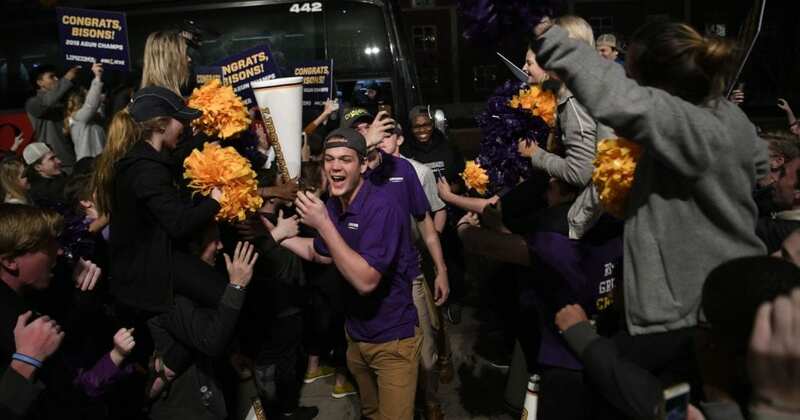 Lipscomb fans celebrate their team’s first NCAA Tournament bid. However as A-Sun champions and the 15th seed in the West, they open Friday in Charlotte, North Carolina against defending national champions North Carolina. When the college basketball season began, Middle Tennessee State University was regarded as the local team with the best shot at making the NCAA Tournament, followed by Belmont. But Sunday when the selections were announced, neither of them were part of the field. Instead, Tennessee, picked to finish 13th in the SEC during preseason, and Lipscomb, a team that had never made it to the NCAA Tournament since becoming a top tier program, were in and both MTSU and Belmont were out. Tennessee won a share of its first SEC regular season title since 2008, and despite losing in the SEC Tournament Finals to Kentucky, were tabbed a number three seed in the South Regional. They play Thursday at 11:40 a.m. against Horizon League winner Wright State in Dallas, Texas. It is Tennessee’s first NCAA bid since 2014. Should they win that one, they would face on Saturday the winner of the game between sixth seeded Miami and 11th seeded Loyola of Chicago for a chance to reach the Sweet 16 and play in Atlanta. Lipscomb as Atlantic Sun champions face a much tougher task. They are the number 15 seed in the Western Regional and as a result find themselves matched against the number two seed and defending national champions North Carolina. Making matters worse is that they must play them in Charlotte, North Carolina Friday at 1:45 p.m. in what looks about as close to a home game for UNC as possible in what’s supposed to be a neutral site tournament field. Still, given it’s Lipscomb’s first NCAA bid ever, they are happy about it, even if no one gives them a remote chance of advancing. Meanwhile the two teams that most observers felt would be playing this week took different paths. A disappointed MTSU team did accept an NIT bid. The Blue Raiders opened the NIT field as a number three seed, and faced Vermont at home Tuesday night. What had at its peak been a great season with them breaking into the Top 25 unraveled in a five day period from March 3-8. During that time they dropped the regular season finale to Marshall, then were upset in the Conference USA Tournament by Southern Miss, a team with a losing record. Despite having 12 road wins and an RPI of 33, MTSU was out. Belmont lost the OVC Tournament finale to Murray State, and turned down bids from two lesser tournaments, the CBI and CTI. So as it turns out, the preseason choices didn’t make it, while the surprise teams continue playing.